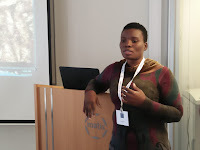 After attending the World Seafood Congress and the Icelandic Fisheries Exhibition, one of our 2017 Peter Howgate Award Winners, Hannah Antwi, stated that her participation in the events really helped to increase her knowledge of fisheries and has provided many ideas to improve the quality of Ghana’s fish products, for both local and international markets. She especially appreciated the exposure to IAFI’s international networks of experts who will support her work, and help in her aim to reverse the trajectory of Ghana’s fishery and improve post-harvest conditions of fish handling, processing and marketing. Hannah indicated that the Icelandic fisheries exhibition also provided her with lots of ideas on value addition and income generating activities which could be replicated in Ghana. Because of her participation she was also able to identify organizations and individuals who are willing to support technological innovations, demonstrations and extension initiatives in small-scale businesses in the fisheries sector. As a young fisheries technologist, she has also realized that women play a special role in sustaining aquatic resources, a role which she will seek to promote and develop. Overall, Hannah considers that the 2017 World Seafood Congress will help to shape her career, by guiding her to adopt and make right decisions that will benefit Ghana, and serve as a mirror for others.